Women’s champ: Jordyn Hassett tops the Women’s Road Club Championships alongside Bizzy Butterworth (second) and Dale Maizels (third). Picture: Supplied. THE Mornington Cycling Club hosted their season’s highlight, the MCC Road Club Championships, in Main Ridge on Saturday 10 November. Up-and-comer: Jack Marshall receives the under-19s trophy with Joel Hawkins’ mother, Liza, and coach, Chris Savage. Picture: Supplied. 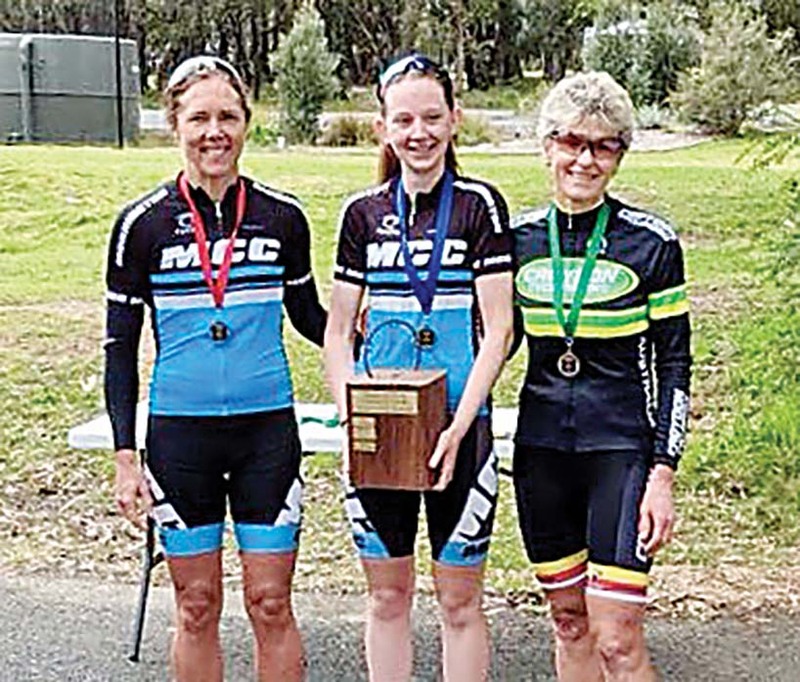 The MCC Road Club Championships has long been touted as the club’s biggest day of the year, and this year it was certainly no different. The pinnacle of the club’s year had the biggest turnout they’ve ever had with the women’s competition enjoying more popularity than in recent years. Mornington Cycling Club president Bruce Trew said the event certainly lived up to its high expectations. “It went really well,” Trew said. “The weather was perfect. It was meant to be the best day of the year and that’s exactly what it was. 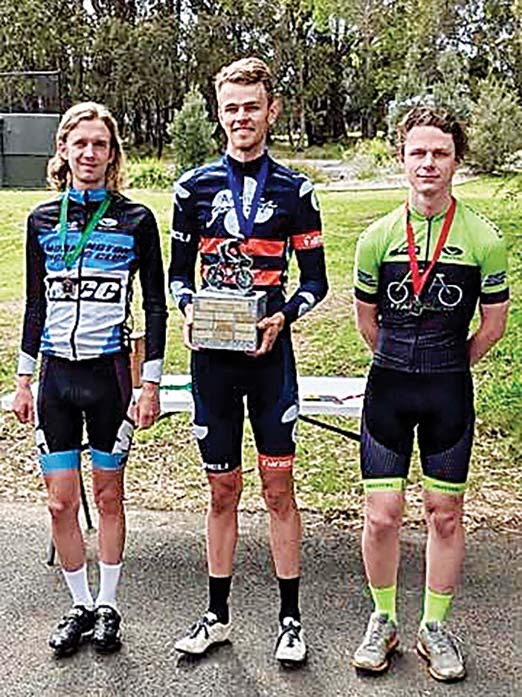 The main events were won by Alex Holden who took out the Men’s Road Club Championship and Jordyn Hassett who won the Women’s Road Club Championship. Holden’s win in the Men’s Road Club Championship, brought up his third straight year of success in the feature event. Trew said it has been great to see Holden continue his successful run. “He’s really dedicated, rides copious amounts of kilometres and is just really committed to his riding,” he said. 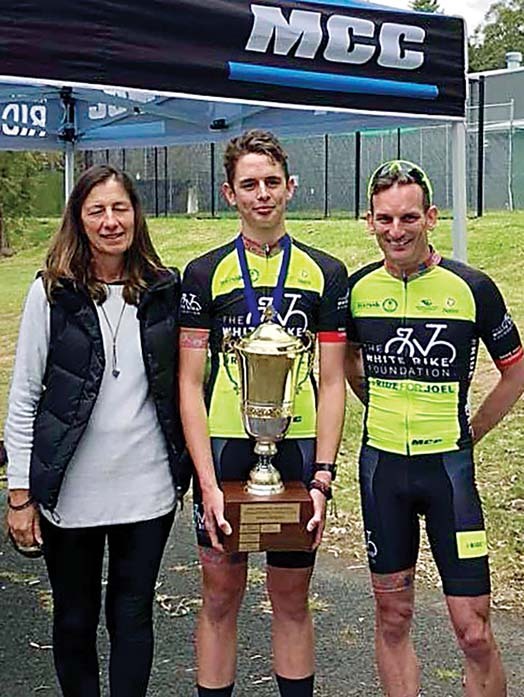 Holden has been riding as part of the elite road cycling team, Anchor Point South Coast Cycling, for the past year and has been competing on the National Road Series circuit. Another notable winner from the championships was 18-year-old Jack Marshall who won the under-19s event as well as being awarded the under-19s Joel Hawkins Scholarship. The scholarship offers the up-and-coming talent support for his road cycling development over a 12 month period as a racing member of MCC. It also provides him with a full package of coaching, physical therapy, bike servicing, MCC membership and kit. Three-peat: Alex Holden claims his third straight Men’s Road Club Championship. Picture: Supplied. Trew said they couldn’t have found a better recipient for the award. “He was a really worthy recipient, his application was amazing and he was just the perfect candidate for the award,” he said. In the Legends division: First: Colin Morris, second: Ben Shuster, third: Clive Strickland; Super Masters: First: Neale Adams, second: Edy Gasparini; Masters: First: Jackson Sharples, second: Dean Phillips, third: Bruce Trew; under-19s: First: Jack Marshall, second: Nathan Mann, third: Flynn Atkins; Elite Men: First: Alex Holden, second: Andy Gynes, third: Jet Turner; and in the Elite Women: First: Jordyn Hassett, second: Bizzy Butterworth, third: Dale Maizels. The Mornington Cycling Club will hold one more competition for the season, the Criterium Championships, which will be held at Casey Fields in December.